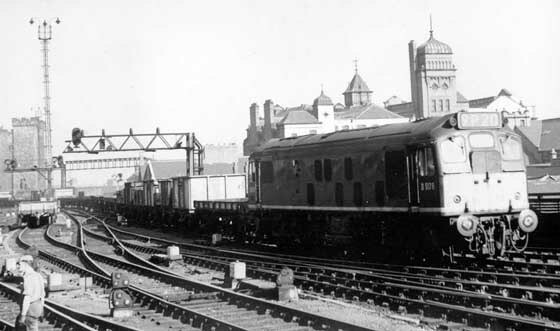 Photograph collection of webmaster D5179 passes through Newcastle with a lengthy freight train on September 16th 1963. The fourteen year six month career of D5179/25029 was spent allocated to depots on the Eastern, Western, Scottish & London Midland regions. D5179 - D5182 were ordered without boilers which no doubt had a modest impact on their allocation history. Like 25026 - 25028, 25029 spent its first seven years on the Eastern Region but then moved to the Western Region for five years service in the Welsh Valleys. Shorter periods then followed for service in Scotland & the Midlands. Cab-front gangway doors never removed. Always carried four digit headcodes (no dominoes). 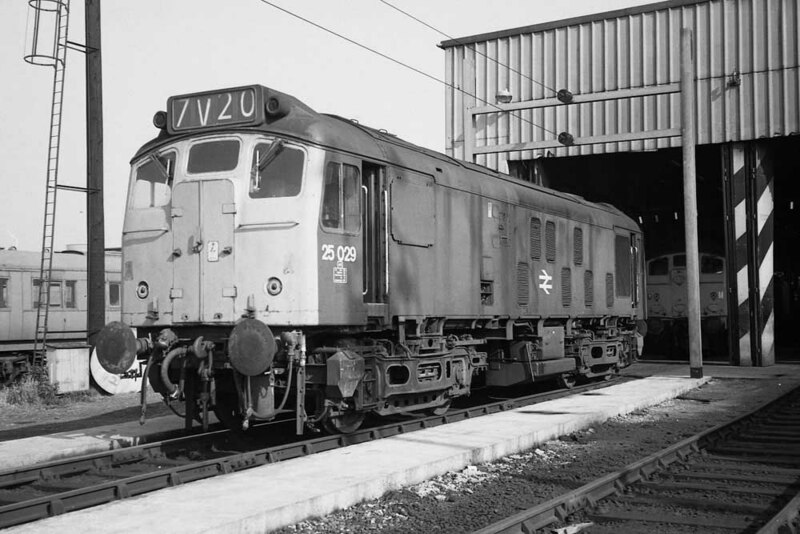 25029 was the 18th Class 25 withdrawn, the only Class 25 retired during August 1977. After withdrawal 25029 was stored at Derby Works during August & September 1977 prior to moving to Glasgow Works by eary October 1977. By March 1978 25029 had been broken up although the cabs lingered until the end of 1984. Noted very ex-works September 1966. Noted Derby Works April 1972. The frames for D5179 were laid down at Darlington Works during November 1962, with the locomotive being released to traffic on February 11th and allocated to Gateshead depot. Whilst allocated to Gateshead D5179 was noted on the Tyne Dock - Consett iron ore workings during September 1966. Condition September: (very ex-works) green livery with small yellow ends, curved upper corners, yellow panel covers frame level stripe. After four years working out of Gateshead, D5179 was transferred to Holbeck (55A) during January as part of the effort to clear West Yorkshire of steam traction. 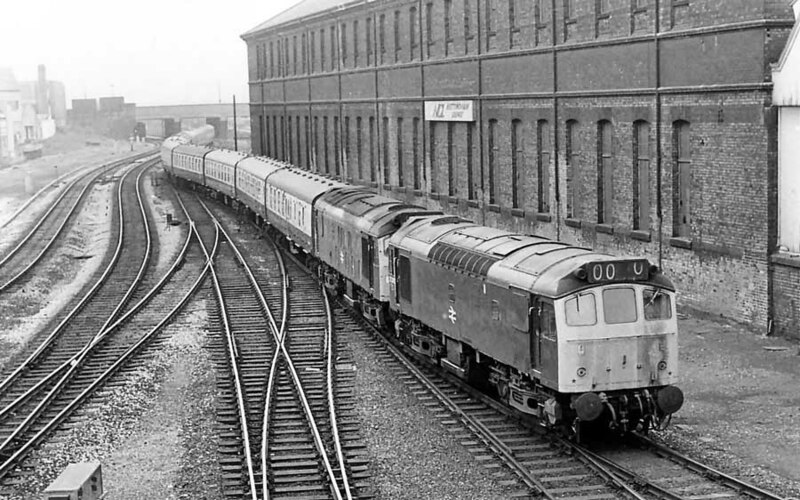 During November Holbeck sent six of their non-boilered Class 25's - 5179-82 & 7624/25 to Newport - Ebbw Junction (86B). Their duties included the Lydney and Parkend branches, the Pontypool Road shunt and the heavier iron ore workings between Newport Docks and Ebbw Vale or Llanwern steelworks. The Parkend branch saw considerable mineral traffic necessitating as many as three daily trips, usually on Mondays, providing much ballast for the permanent way department. 5179 was noted at Derby Works during April. Pairs of Class 25s on the WR mainline included those in charge of freight workings from Severn Tunnel Jct to Didcot or Acton, so noted on July 18th were 5179 & 7519 eastbound on a coal train. Ballast extras from Chepstow also brought the Class 25’s to various locations on the Paddington mainline. During May 25029 moved to Cardiff. On June 8th 1974 25029 & 25325 worked the Derby - Norwich - Yarmouth - Norwich - Walsall diagram. On July 29th 1974 25029 and a Class 37 were the Lickey bankers. Photograph courtesy of Tom Sutch 25029 stands outside the shed at Springs Branch sometime during June 1975. On April 15th a Cheltenham Spa - Swindon service suffered a diesel multiple unit failure which then required the assistance of 25029. On July 5th 25029 worked a York - Tyne Yard freight. With the end of the summer timetable and the Western Region's dislike of the Class 25's, 25029 was transferred to Haymarket during October, then Inverness in November. April 6th found the double headed 16.35 Inverness – Glasgow Queen Street in trouble at Kingussie when leading locomotive 26034 failed, being removed and replaced by 25029 off a northbound freight. However 25029 was later detached at Stirling reportedly after parts from it hit a freight train near Dunblane, leaving 24121 to carry on alone reaching Glasgow two hours late. Photograph courtesy Tony Sayer. 25029 makes a striking pose as it stands at Millerhill on June 6th 1976. This same month it will move south to Toton, where it will spend one more year in service. 25029 was stabled on Haymarket at lunchtime on May 2nd. During May 25029 was transferred to Toton, this was its last transfer. On July 10th 25029 & 25303 worked a Derby - Yarmouth service. A lengthy trip took place on August 14th 1976 with 25029 & 25211 working the 09.49 Nottingham - Paignton, a distance of 261 miles. 25029 was stabled at Wellingborough on February 5th. Photograph collection of Ian Hammond. 25205 leads 25029 into Nottingham with the 09.52 departure to Skegness on June 4th 1977. This is the last summer of operation for 25029, by August it will be retired. In addition to the Skegness service pictured above, the same pair of Class 25s worked a relief Nottingham - Skegness roundtrip on June 7th 1977. On July 3rd 1977 the 08.45 Birmingham New Street - Barmouth and the 17.30 Barmouth - Birmingham New Street were worked between Birmingham New Street & Shrewsbury by 25029 & 25220. 25029 was withdrawn on August 7th from Toton and sent to Derby Works. By October 1st the locomotive had been moved to Glasgow Works, presumably as a source of spares. The locomotive was broken up by March 1978 but its cabs remained somewhat intact until the end of 1984. 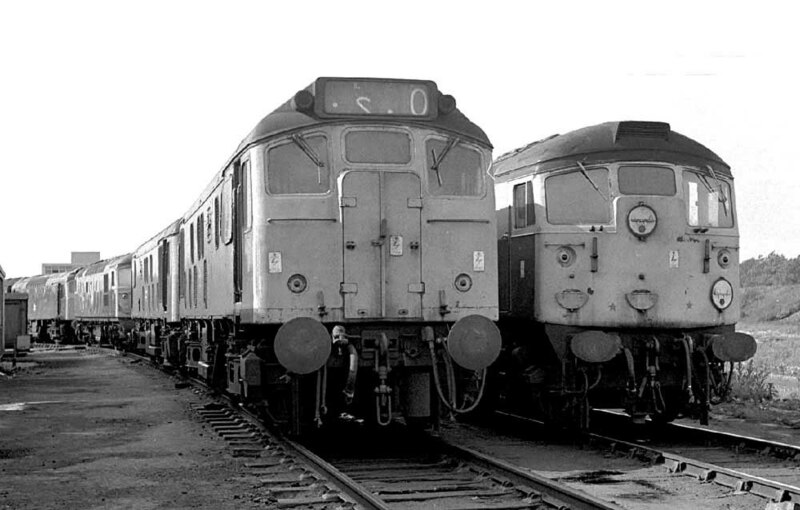 The withdrawal of 25029 and two other Class 25s in 1977 (25031 & 25096) marked the beginning of the end for the Class 25s. Until this point the only Class 25s retired had been those with accident damage. These three machines had been withdrawn surplus to requirements.